An emphasis on building solid fundamentals, with an understanding of the theory behind the pieces that make up a foundation you can build on. This knowledge makes trouble shooting or filling in holes in your foundation real easy, and will let you work independently in the future. Finally understand concepts like “on the bit”, “through”, “riding back to front”, and “connected” – and learn how to do them yourself! All breeds & backgrounds are welcome, this stuff is good for hunters, jumpers, trail horses, and western horses too! Specialization in developing the rider’s seat and understanding of biomechanics to bring out the potential in any horse. Connected back to front, out to the end of the rein, over his back, on the bit, poll high, nose in front of the vertical, diagonal pairs of legs working together… you’d never guess this was an 18 year old ex-racehorse with pins in his ankle! If he can do it, any horse can. Dressage (French for “training”) is a popular English riding discipline that develops a horse’s flexibility, suppleness and fitness, enabling it to perform to the best of its natural athletic abilities. Sometime called “Horse Ballet,” dressage training will develop your horse’s responsiveness to (and the precision of) your aids. As your own riding skills develop, you will begin to feel as though you’re dancing with your mount. 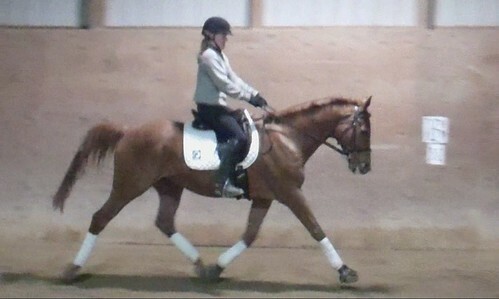 Dressage is fun to learn and builds key fundamental skills in both horse and rider. Would you like to be a more effective rider? Do you wish your horse was more responsive? Would you like to build your confidence as a rider? Do you want to build a partnership with your horse? Would you like to add a whole new level of precision and control to your riding? Do you want your riding to be mentally engaging, systemic, and logical? Are you looking for a low-impact discipline as you make the switch from jumping? If you answered yes to any of these questions, learning dressage is for you. You’ll build your skill set as a rider, developing tools that will win points in the show ring, but will also help you navigate daily challenges – like spooks, obstacles on the trail, or getting the right distance to your fences or the flying changes you need to win your hunter class. 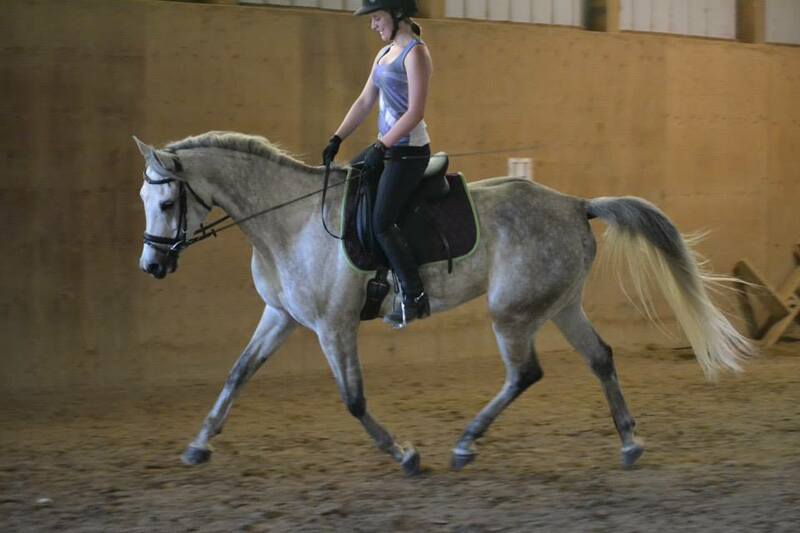 Dressage training improves the fitness and flexibility of both horse and rider. Beginner riders will build a solid foundation upon which they can grow. Experienced riders will hone their skills, developing precision in their aids central to achieving higher levels of performance. At our barn, we value every equine as an individual, and a training program is tailored specifically to the needs of each horse and rider team. We believe that any horse can do dressage, even horses coming from a background in another discipline or breeds not commonly associated with dressage. Each horse is brought along slowly and carefully to develop to its fullest potential through correct work, and we never resort to harsh bits, gadgets, and other short cuts to force the process. We also accept riders from all disciplines, and have found our gentle, methodical approach works especially well on timid riders, re-riders, mature riders, and those who need to build confidence. Although typically done in a traditional dressage saddle, dressage can be done in any saddle and riders who feel more comfortable in a western saddle are welcome to ride in one. Hanna on her Arabian gelding, Sherlock. She has him beautifully connected from behind, over his back, and reaching to the end of the rein… despite the challenges usually associated with horses with this kind of conformation. She has learned to use her body in a biomechanically correct way, and he can’t help but go this nicely for her! 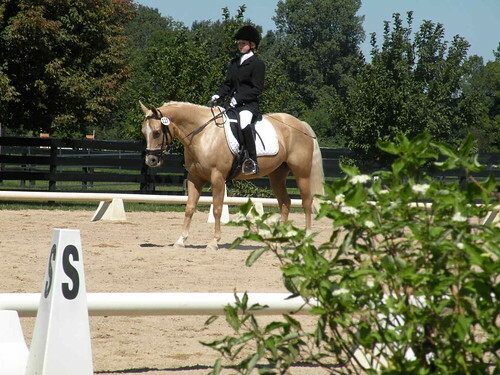 Based in the Chicago suburb of Harvard, Illinois, Rettger Dressage offers riding lessons with a show team open to all. Will travel locally for individual lessons, and clinics can be coordinated anywhere. Please contact me for more information or to schedule a lesson or clinic.